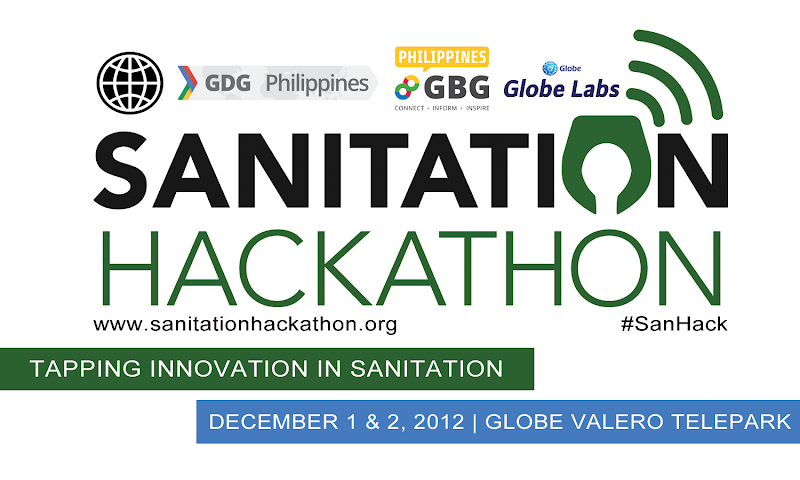 In cooperation with World Bank's Water and Sanitation Program, GDG Philippines will be organizing a Sanitation Hackathon on December 1 and 2, 2012. It will be held in Manila, Baguio, Bacolod, Cebu, Davao and Zamboanga. This hackathon is free! Sanitation Hackathon is a social good hackathon that aims to develop open technology for sanitation challenges. Sanitation development is important in the well-being in the development of the individual, community and the country. It not only has an impact on health but also on economic development. In the Philippines, there are still sanitation challenges and problem - including but not limited to access to clean toilets and education - that needs to solved and the winning tools developed during this hackathon will be used to overcome this challenges. For the Manila hackathon, the venue will be at Globe Valero Telepark (111 Valero Street, Makati City). Registration will be opened in a few days. For more information about the hackathon near you, please wait for the official announcements from the respective GDG. Update: To register for the Manila hackathon, signup here. We'll be emailing the participants additional details in the next days. You can also watch the video of the announcement of winners(via Hangouts on Air) here. Congratulations to the winners and thanks to our everyone who participated! We would also like to thank Globe Labs for hosting the Manila hackathon and for sponsoring the internet connection in the 6 cities.